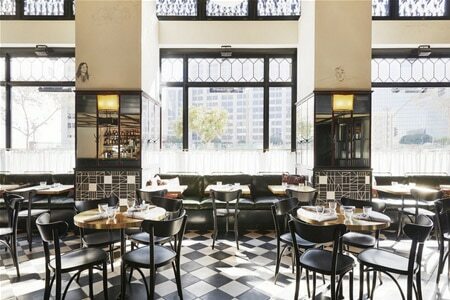 The hotel restaurant at the Ace Hotel Downtown Los Angeles. : LA Chapter, the restaurant at the Ace Hotel Downtown Los Angeles, is something of a sequel to the late Heath Ledger’s Brooklyn restaurant Five Leaves. This West Coast incarnation continues an homage to a blend of Modern American and Aussie cuisines. Chef Micah Fields turns out pasta with uni, duck and spätzle, and an Australian-style burger with pineapple, beets and a fried egg. Expect craft cocktails and a select wine list, as well as summer punch served on the Mezzanine level.